Today at Gartner Identity & Access Management (IAM) Summit, we announced a strategic partnership with ForgeRock to help businesses bridge their digital identity management with a user’s specific consent and preferences choices. ForgeRock transforms the way organizations interact securely with customers, employees, devices and things by providing a comprehensive approach to tackle the digital identity and user experience challenges that arise from increasing regulatory requirements. 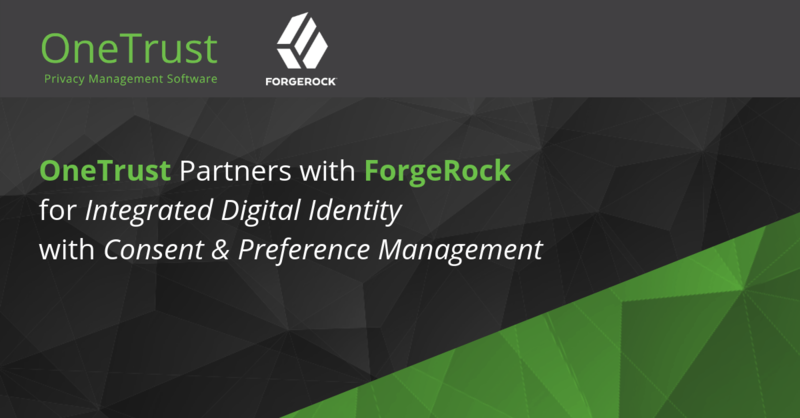 By integrating the ForgeRock Identity Platform™ with the OneTrust Universal Consent and Preference Management platform, users will have a seamless online experience, linking their digital profiles to their unique choices around marketing preferences. As new and updated privacy regulations are continuing to be released more frequently than ever before, it’s important for organizations to reassess the way they collect personal data and communicate with their users to make sure they are compliant. For example, the GDPR has specific requirements around collecting consent that is specific, unbundled and easy to withdraw, and the California Consumer Privacy Act (CCPA) specifies companies to have a “do not sell my personal data” button on their website. With the ForgeRock/OneTrust partnership, organizations will have the unique opportunity to leverage industry leaders in both digital identity and consent and preference management to deliver a seamless experience from a user signing on to an online platform and updating their marketing preferences. We are excited to partner with ForgeRock to bring together two of the best solutions in their industry to tackle some of the unique challenges of the GDPR, CCPA and other global privacy regulations. To learn more read our press release and visit OneTrust’s LinkedIn, Twitter and Facebook. Did you hear that OneTrust was named a leader in the Forrester New WaveTM : GDPR and Privacy Management Software, Q4 2018? Download the report to learn why OneTrust “leads the pack for vision and execution.